The latest Avengers: Endgame promotional art features Captain Marvel and Iron Man as they prepare to take down Thanos. Additionally, the promo art gives us a better look at Carol Danvers' new upgraded suit. Marvel Cinematic Universe fans are impatiently waiting for the sequel to hit theaters, which is nearly a month away. Fan theories have been spreading like crazy, but the Russo Brothers and screenwriters Christopher Markus and Stephen McFeely are pretty sure that nobody has come close to figuring out the mysterious storyline. Captain Marvel has a scowl on her face as she brings her glowing hands together in the latest Avengers: Endgame promo art. With Iron Man standing beside her, the duo look unstoppable, which is something that Thanos may actually fear when he sees who Tony Stark brought along with him this time. Hopefully, the art teases a battle with Stark and Carol Danvers or even a passing of the torch. Marvel Boss Kevin Feige has said numerous times that Danvers will be taking on a Stark-like role in the MCU's Phase 4. The Avengers: Endgame artwork is also notable for showing off Captain Marvel's new and improved suit. From the looks of things, Tony Stark may have had something to do with it since it features some gold pads or sensors on the shoulders, just like his Iron Man suit. With that being said, it's tough to make out what else is going on in the sleek new design. It has not been confirmed at this time if Stark tinkered with Carol Danvers' suit, but it is possible. Captain Marvel has been introduced to the Avengers: Endgame promotional material and it has a lot of MCU fans wondering how she will be integrated into the movie along with the rest of Earth's Mightiest Heroes. Her own standalone movie has proven that she is the most powerful character to be introduced thus far, but how will that come across in Endgame? She can't just walk in and singlehandedly take down Thanos, that wouldn't be very good at all. Kevin Feige has teased that Carol Danvers will have an Achilles heel, but we're not sure if it will be introduced this time around. Avengers: Endgame hits theaters in North America on April 26th. It will open a few days earlier internationally, so be on the lookout for spoilers. There is still so much that is unknown when it comes to the final movie in the MCU's Phase 3, a culmination of 11 years and 22 installments, but that hasn't stopped fans from trying to speculate about how everything will go down when Earth's Mightiest Heroes attempt to reverse the Mad Titan's Decimation. Thankfully, we don't have too much longer to wait for Marvel Studios to release the highly anticipated sequel. 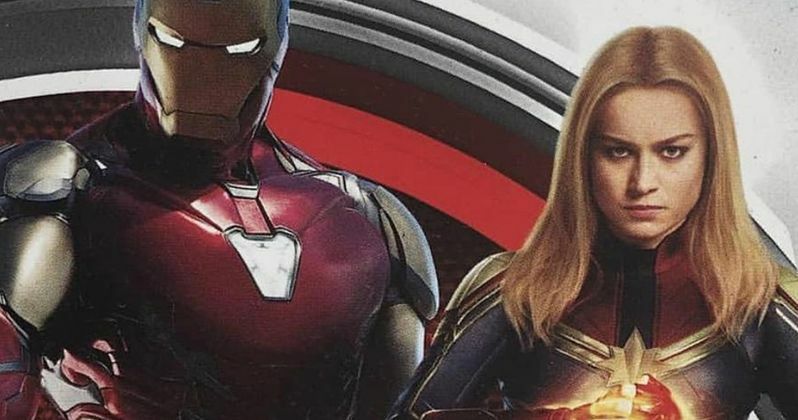 You can check out the latest Avengers: Endgame artwork featuring Captain Marvel and Iron Man below.